and our friends in the EU. At first, this poem, read by Angela Leadsom to an unwilling gaggle of MPs in the House of Parliament yesterday, may seem slight. Some might even be of the opinion that it is not a good poem, but that would be to underestimate Leadsom’s much-heralded wit, intelligence and ability to present herself, with composite skill, as entirely empty-headed. The first two lines follow convention and lull the reader into a false sense of anticipation. Leadsom pretends to present the world as it is (with an obvious nod to ‘The Man with the Blue Guitar’ by Wallace Stevens): Labour = red, Tories = blue, and this appeals to what most readers desire when they come across information: “I agree with that”, we think, and already Leadsom has us on her side. She has told us two meaningless ‘truths’ and we are already more likely to accept whatever follows, whether true or false. The literary allusion to Stevens, both in terms of philosophical outlook and in colour, demands that we take her claims seriously. “Our future is bright” strikes home with the force of a sledgehammer hitting David Cameron’s £25,000 hut. You can still hear the deafening applause in Parliament and in the country even now. This “future” can only be a sly and covert reference to Futurism, the Italian artistic movement of the early 20th century. The dawning of the “bright” has connotations of purity, a new order of vegetable forming in the carrot vomit of the old. Most of the original futurists, including founder Filippo Tomasso Marinetti, flirted with fascism and several became members of neo-Nazi groups. Perhaps some may feel I am reading too much into this line, but such an ambiguous symbol demands great responsibility. Authors need to be aware of all possible connotations that critics may impose on their work and purge it accordingly. It is also likely that “bright” is an allusion to Art Garfunkel’s “Bright Eyes”, the theme-song from Watership Down, a tale of chemical warfare and genocide. On the other hand, it may just be a clever play on the mobile phone advertising slogan, “The future is orange”, which brings Donald Trump to mind, and the next line references both fascism and Trump – the first time I believe these two concepts have ever appeared in the same sentence. Angela Leadsom is truly a prophet and genius. Anyway, “with a good deal in sight” subverts all possible expectations. For one thing, the ancient Valentine form requires this fourth line to be the final line, with a clanging –oo rhyme, but Leadsom does what no one before has dared to do. She inserts two additional lines and changes the face of poetry as we know it. “Good deal” is a clear reference to ‘The Art of the Deal’, a book in which Donald Trump explains how to lead potentially successful businesses into financial ruin and bankruptcy, and yet still holds out hope of becoming president of your national playground. It’s that rising from the carrot vomit again, the steely vision of “sight” and its obvious chime with the invisible but all-too-present word “right”, which must mean far right, as what else could it possibly mean? Well, the oral delivery of Leadsom’s poem may be key to alternative explanations. The line could really be “with a good deal in site”, which could refer to the geographical area of the UK. Like a ghost, the invisible and unheard rhyme would this time be spelled “rite”, which conjures up religion and the sacramental rites of Fishism (more of fish later) practiced in the ancient Sewers of Confusion due north of Mordor. Also, due south of Hogwarts. Chalk symbols on the sewer caves like this > <)))⁰> give credence to the theory, although their authenticity is in dispute even within the Haddock Kingdom. Some critics posit that Leadsom had meant to say “with a good deal in shite”, which Leadsom has refused to confirm or deny. That word “you” is echoed both in the first syllable of “UK” and also (in the final line) in the second syllable of “EU”. Leadsom’s dazzling virtuoso technique is worthy of an A-level syllabus poem. The poem is an icthyic code, like a little sardine for dismembering itself. And talking of fish again, this line floats the fishing industry before us like bait caught on a rusty hook. Will we bite? We will! We can taste the poem and it tastes good, and we start to feel positive about its message of exiled celebrity and filleted hatred. Exiled celebrity? The last line, “and our friends in the EU” is key. This suggests that Monica, Chandler, Ross, Rachel, Phoebe and Joey are covertly living in mainland Europe, no doubt waiting for the No Deal opportunity that will flood the UK with chlorinated chicken and hormonally blootered pork. Our screens will be full of the Friends drinking expensive coffee and quoting Hera Lindsey Bird and eating pastrami while pizza, Stella Artois, croissants and Rioja disappear from supermarket shelves. That “EU” is an ominous way to end. Besides the entirely original you/U pun, which I hear some youngsters have already begun to use by texting it on mobile phones, the letters EU are the first two letters of the word ‘eugenics’, which brings us full circle back to fascism again. Or perhaps just rabbits, fish, American sit-coms and Art Garfunkel. It could even be nothing, but these days one can’t be too careful. The groans which greeted Leadsom’s announcement that she had a poem to read will be familiar to anyone who has tried to read a poem to a chamber full of people who hate poems. They were perhaps not really listening carefully enough, but I hope our MPs will read this and unpin a Brexit to match the poem’s meta-postmodern flair, while still failing to reach a consensus on what was supposed to constitute either Brexit or meta-postmodernism in the first place. A couple of months ago, I read this article by Jonathan Jones about art that followed on from the Russian Revolution. He complains that it tends to be exhibited without reference to the millions of people who died under Lenin and Stalin while the artists bolstered the state’s propaganda apparatus. He complains that the title of an exhibition in the Royal Academy of Arts, in London – Revolution: Russian Art 1917-1932 – suggests the usual uncritical approach to one of the most murderous regimes in history. It might have been a better idea for Jones to wait until the exhibition had opened and to have gone to see it, before passing premature judgement, because the exhibition asked all the questions Jones wanted it to ask, and more besides. It is quite wrong of him to suggest the art produced in that period was no more than state propaganda. Much was, but he does a disservice to those who kept innovating and protesting in extremely difficult circumstances, many of whom paid a heavy price. Also, some of these questions begin to feel as relevant to today’s world and its impossibly confusing political realities as they do when applied to the Russia of 1917-1932. The period 1917-32 encompassed significant artistic innovation along with increasing state control and interference. The Soviet state wanted ‘socialist realism’, by which they meant nothing abstract that couldn’t immediately be understood by “the masses”. But they didn’t want realism in the sense of depicting reality. Stalin’s five-year plan (1928-32) uprooted peasants from their farms and forced them to work in massive compounds. The result was famine. A conservative estimate of the death toll during his dictatorship would be around 7 million people (that doesn’t include the 12 million who died in the gulags or the 2 million who were simply executed without trial. The numbers are sickening). But most art depicted happy peasants, healthy animals, golden fields, shiny tractors. When Theresa May declares that the country is coming together over Brexit, there is a similar disconnection from reality. The country is very divided, perhaps increasingly so. When May says that opposition parties have been disrupting the Brexit process in Parliament, that doesn’t reflect reality either. There has been no serious opposition to Brexit at all because Labour has voted with the Conservatives. So both of her statements, cited as reasons for calling the election on 8 June, are nonsense. She doesn’t need art to back her up. In the Soviet Union post-1917, visual and written art was one of the most effective ways of disseminating information and propaganda throughout a vast country. Theresa May has the Daily Mail, Express, The Sun, Telegraph etc to do that job, and social media (Facebook, Twitter etc) to make sure liberals have an outlet for their outrage that doesn’t actually achieve anything or communicate ideas outside their own circles of similar ‘friends’. They are of course free to fight against and ‘unfriend’ each other! The Soviet state-approved art was meant to have instant effect. The “masses” would view the art and would immediately understand it. It would tell them how much Stalin and the state ought to be admired and about all the pursuits, such as sport, the people ought to take up. Portraits of sporting heroes with perfect bodies were commissioned to be admired by the people. It was instant art, a ‘dumbing down’, a (in case there is doubt) condescending attitude towards audiences. People were not supposed to think about anything too much, particularly about ambiguities that might cast doubt on the Soviet project. These things are all still with us! The media of television, with five thousand channels 24 hours a day, live poetry that peddles a simple message that can be immediately internalised, manufactured pop, online everything: it all bombards us and much of it (usually the stuff that’s easiest to access) demands we stop thinking and instead just passively “relate”. The Olympics in London was used by the UK Government for propaganda purposes, and money was poured into Olympic sports afterwards (siphoning from the arts/culture budget). The Conservative party had obviously learned something from Stalin. across the court with no face at all. Malevich played by the rules enough not to have his faceless work banned, but he found a way of expressing reality that wasn’t the official version of reality and subtly criticized it. Clearly, there are no direct parallels to draw between Stalin’s genocide (20 million people! Probably more.) and the political situation in 21st century UK, but politicians today do frequently express opinions that entirely distort reality and seem happy to defend systems that destroy people’s lives, without a hint of compassion. If you are unemployed and turn up 15 minutes late for an appointment due to a bus breaking down, your benefits can be stopped for weeks. What are your kids supposed to eat? How do you pay the bills? What about your rent? The Government just don’t seem to care about reforming the broken system. They just assume someone is running a food bank near you and, if no one is, too bad! Ken Loach’s film, ‘I Am Daniel Blake’, told the story of two characters trapped in the Kafka-esque benefits system. Conservative MP, Iain Duncan Smith, said that the film did not depict reality. It is true that food bank queues are not always as long as in the film. But sometimes they are. It is true that sometimes people are treated with more compassion and understanding than the film’s main characters. But often they are not. The film tells a story and it is a sadly realistic story. For an MP to deny this is ridiculous. Doing so distorts reality and replaces it with propaganda, a dangerous propaganda that whitewashes serious problems. After the Russian revolution in 1917, Lenin saw value in art only as propaganda to spread word of how state policy was improving people’s lives, while millions starved. Many artists who had initially supported the revolutionary ideals became disillusioned both by the vast inequalities widening in their society and by the state censoring artistic responses. The great poet, Alexander Blok, fell ill and requested permission to find life-saving medical treatment abroad, but was denied, due to his critical stance. Permission arrived – but only two days after his death, and the delay wasn’t an accident. Stalin gave an impressive demonstration of how deep hypocrisy can run by then praising his work publicly, just as he did to Vladimir Mayakovsky after the latter killed himself in depression at what the revolution had become. Stalin called him “the greatest poet”. Presumably Stalin only liked the stuff that had been state-approved and turned a deaf ear to the rest, which he’d made invisible anyway. When David Cameron declared The Smiths were his favourite band, I can only guess he’d never bothered to listen to the lyrics and Johnny Marr’s witty response felt somehow necessary. In early Soviet Russia, however, those who were openly critical, like Anna Akhmatova, were made to suffer for their entire lives. Those who adopted a more subtle approach were able to continue to make art and exhibit it, albeit with occasional state denunciation along the way. I don’t mean to make light of that either, as it must have been incredibly difficult. It took 15 years for all art that fell outside socialist realism to be banned completely and the 1932 exhibition was the final public display of relatively pluralist art in Stalin’s Soviet Union. It is important to be vigilant today, I think. Steven Poole wrote an excellent article in The Guardian about how hard-Brexit rhetoric turned Leninist, which has thankfully meant my already long article here can be shorter than otherwise. When the Daily Mail has a headline, ‘Crush the Saboteurs’ (link is to Twitter, not to the DM), in reference to the EU referendum Remain voters, that’s crossing a line from democracy to tyranny, and even calling a general election three years early because a Prime Minister feels existing democratically elected representatives may not do exactly as she wants could also be seen as an attack on democracy. Stalin took 15 years gradually to ban all except one style of art. How is democracy in the UK going to look after 15 years of small chippings away? How complacent can we afford to be? When bread rationing was introduced in the 1920s, Soviet workers were allocated a half loaf per day; more than four times that allocated to the ‘bourgeousie’ and the dissidents etc, but if it’s all you have on your table for your family, it’s not going to be enough, one of the reasons why so many millions died. Government officials and party boffins were also granted half a loaf but I imagine their loaves were somewhat bigger and their dinner menus rather less austere! David Shterenberg was in charge of implementing Soviet cultural policy as head of the department of visual arts. 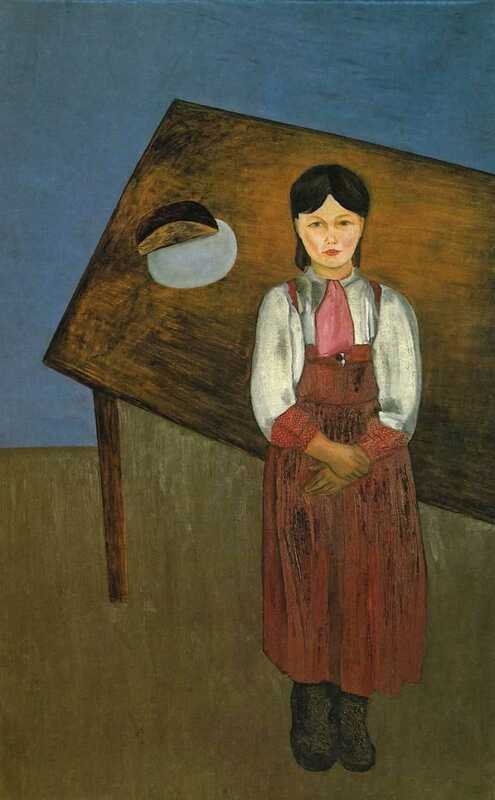 His painting Aniskov shows a very well dressed girl, but he also shows clearly a table with a single half-loaf of bread on it. It’s not much, and Shterenberg wants us to know it. He fell out of favour with the authorities in the 1930s, unable to hold his imagination within the confines of socialist realism. When UK politicians demand that art must demonstrate economic benefit to be eligible for state funding, they are also operating a kind of censorship – more subtle that Stalin but there nevertheless. They will support and promote state-approved art that is in some way commercial – that will sell well or get bums on seats or cultivate the existing celebrity of an artist or whatever – and starve work that may be better, more innovative or challenging, and ahead of its time. They ensure that some art is visible and other art much less visible. The value of the art as art has nothing to do with state support. It means that festivals and major exhibitions are under pressure not to showcase anything too cutting-edge. Perhaps that’s why the same names crop up on most UK poetry festival billings again and again and again (with some courageous exceptions). Some artists in early Soviet Russia looked to former times to suggest ways forward. Mikhail Nesterov’s ‘Philosophers’ portrays two philosophers: the priest and mathematician Pavel Florensky and the theologian and economist Sergei Bulgakov. The artist is trying to capture a meeting of deep spiritual values that could pave a way ahead. As it was, Bulgakov was expelled from Russia in 1922 and Florensky was arrested in 1933 and shot dead in 1937. But the painting has preserved them and also gives a flavour what they stood for. The first thing you see if you visit the wikipedia pages of Florensky and Bulgakov is Nesterov’s portrait of them! Perhaps that’s one reason Stalin was so suspicious of art and why people who want to amass power for themselves irritably sense the value of art even while declaring most of it to have no value at all. Art preserves and re-presents. The exhibition had a room where images of people killed under Stalin were projected onto a screen. There were artists, poets, doctors, schoolteachers, farmers, housewives etc, most of whom looked as far from a typical saboteur image as it’s possible to get. I stood and watched for about 10 minutes and felt grateful somehow that their courage and identities had been preserved for this setting even if their lives had been cut short. Where can we find values for art that point to deeper truths and values than our elected politicians, who are often reacting simply to contemporary winds and fears? There may be many places: philosophy, history, theology, wisdom writings both religious and humanist (progressives in both camps ought to stop warring with each other, and instead turn their attention to their common enemy), cinema, visual art itself, literature, poetry – I think we need to look back to great artistic works and find again what they have to say to us in our contemporary societies. These works are great often because they make sense in different ways in different times. They may not preach truths but the truths are there to be found within them and then directed to those in power when they abandon important values to solidify and increase that power. Art doesn’t exist in a vacuum. Poetry has a habit of being read most when it is perceived as a threat. We do need to find a new way of doing politics. In several countries, outsiders have taken on the establishment recently. Some have been right-wing populists (Trump, Le Pen, Farage) but I do think that people would also respond to a left-winger with sufficient charisma and vision. Here in the UK, there is a political vacuum and if no one from the left, from beyond the traditional party system, fills it with real energy, vision and rhetoric, then the right-wing will consolidate their grip. It might seem that art, poetry, prose, music, cinema and theatre have only a peripheral role but the attention that tyrants and would-be tyrants give them suggests their practitioners are wrong when they downplay themselves. Maybe it’s time that artists started to form a more effective political opposition than at present and see if we can count for anything before it’s too late. The late Tedious Schmooze was unavailable for comment, but several spokespersons from beyond the grave have remarked on their concerns that his reputation may be tainted if Mr Glove runs out as winner. Surroundings Two Blog at WordPress.com.